One of the great pleasures of running this blog is that I often receive contacts from people in all corners of the world on topics related to Paddy and his friends. Sometimes this can lead to putting people in touch who have lost contact, or being able to upload some interesting content for you all to enjoy. In early October I was boarding a plane to Spain to walk a short leg of the Camino Frances from Leon to Santiago de Compostela, when I received an email from John Ewing. We have never met but he was trying to reach Billy Moss’ daughter, Gabriella Bullock, to pass on some items from a trans-Pacific journey completed by Billy in 1959. They have never met, and Gabriella was unaware that this information existed. My name is John Ewing, I sailed with Billy Moss across the South Pacific in 1959. I have quite a lot of information and some photographs of the trip and Bill, which I would like to share with his family. It is likely that your society would have contact details for his very proud daughter Gabriella, I would appreciate your forwarding this email to her so that we may communicate by email. I was able to put them in touch and I am grateful to John for sharing this photograph of Billy at the wheel of the yacht Crusader, on the way to Rarotonga, the most populous island of the Cook Islands. How wonderful is this?! Please don’t hesitate to get in touch if you have something to share with the blog community of over 1,000 readers. See About and Contact for details. This entry was posted in Ill Met by Moonlight, Paddy's Friends and tagged Billy Moss, Gabriella Bullock, William Stanley Moss on November 4, 2018 by proverbs6to10. This review of M I Finley’s A World of Odysseus, discusses the hypothesis that oral heroic poetry is not a medium that preserves historical fact, mentioning specifically how the deeds of Paddy, “Billy” Moss, and the others who kidnapped General Kreipe were raised to the level of Cretan heroic oral history, but by 1953, all the names had been forgotten or deliberately erased (the relevant part is highlighted for your convenience). Finley remained one of what he calls a “heretical minority”; and it soon became apparent that the decipherment of Linear B, far from confirming the thesis that the Homeric poems were a reflection of Mycenaean society, had in fact dealt that thesis a fatal blow. It is hard to think of Homer’s Agamemnon as living in the same world with that wanax of Pylos, whose scribes duly recorded that “Kokalos repaid the following quantity of olive oil to Eumedes: 648 liters; from Ipsewas 38 stirrup-jars.” The bureaucratic inventories of the Bronze Age palaces resemble the detailed records of the Near Eastern civilizations which preceded them and the intricate accounting of the later Ptolemaic papyri, but anything more alien to the mentality of illiterate freebooters such as Achilles and equally illiterate pirates such as Odysseus can hardly be imagined. The tablets also demonstrated that the precise geographical description of Nestor’s kingdom at Pylos which is offered in Book II of the Iliad bears practically no relation to the Mycenaean facts; the conclusion, that the poet or poets knew little or nothing of western Greece, might already have been surmised from the confused and confusing Homeric descriptions of the hero’s homeland, Ithaca. And meanwhile, quite apart from the tablets, it was becoming steadily clearer to all but the most stubborn that there was very little in the archaeological record which would serve to connect the world of the poems with the Bronze Age. Oral heroic poetry is not a medium that preserves historical fact—as Finley pointed out, with a reference to the Chanson de Roland, which made out of a Basque attack on Charlemagne’s rear-guard an assault by Muslim beys and pashas, all carefully identified by names which are “German, Byzantine, or made-up.” A modern example, from the Second World War and from Greece itself, strengthens his case and gives a fascinating glimpse of epic “history” in the making. In 1953 the late Professor James Notopoulos was recording oral heroic song in the Sfakia district of western Crete, where illiterate oral bards were still to be found. He asked one of them, who had sung of his own war experience, if he knew a song about the capture of the German general and the bard proceeded to improvise one. The historical facts are well known and quite secure. In April 1944 two British officers, Major Patrick Leigh Fermor and Captain Stanley Moss, parachuted into Crete, made contact with Cretan guerrillas, and kidnapped the German commanding general of the island, one Karl Kreipe. The general was living in the Villa Ariadne at Knossos, the house Evans had built for himself during the excavations. Every day, at the same time, the general was driven south from the Villa to the neighboring small town of Arkhanes, where his headquarters were located. He came home every night at eight o’clock for dinner. The two British officers, dressed in German uniforms, stopped the car on its way home to Knossos; the Cretan partisans overpowered the chauffeur and the general. The two officers then drove the car through the German roadblocks in Heraklion (the general silent with a knife at his throat) and left the car on the coast road to Rethymo. They then hiked through the mountains to the south coast, made rendezvous with a British submarine, and took General Kreipe to Alexandria and on to Middle East Headquarters in Cairo. “An order comes from British and American headquarters in Cairo to capture General Kreipe, dead or alive; the motive is revenge for his cruelty to the Cretans. A Cretan partisan, Lefteris Tambakis (not one of the actual guerrilla band) appears before the English general (Fermor and Moss are combined into one and elevated in rank) and volunteers for the dangerous mission. The general reads the order and the hero accepts the mission for the honor of Cretan arms. The hero goes to Heraklion, where he hears that a beautiful Cretan girl is the secretary of General Kreipe. “In disguise the partisan proceeds to her house and in her absence reads the [English] general’s order to her mother. When the girl returns he again reads the general’s order. Telling her the honor of Crete depends on her, he catalogues the German cruelties. If she would help in the mission, her name would become immortal in Cretan history. The girl consents and asks for three days time in which to perform her role. To achieve Cretan honor she sacrifices her woman’s honor with General Kreipe in the role of a spy. She gives the hero General Kreipe’s plans for the next day. “Our hero then goes to Knossos to meet the guerrillas and the English general. ‘Yiassou general,’ he says. ‘I will perform the mission.’ The guerrillas go to Arkhanes to get a long car with which to blockade the road. Our hero, mounted on a horse by the side of the blockading car, awaits the car of Kaiseri (that is what the bard calls Kreipe). The English general orders the pistols to be ready. When Kreipe’s car slows down at the turn he is attacked by the guerrillas. Kreipe is stripped of his uniform (only his cap in the actual event) and begs for mercy for the sake of his children (a stock motif in Cretan poetry). So much for epic history. Nine years after the event the British protagonists have been reduced to one nameless general whose part in the operation is secondary and there can hardly be any doubt that if the song is still sung now the British element in the proceedings is practically nonexistent—if indeed it managed to survive at all through the years in which Britain, fighting to retain its hold on Cyprus, became the target of bitter hostility in Greece and especially among the excitable Cretans. It took the Cretan oral tradition only nine years to promote to the leadership of the heroic enterprise a purely fictitious character of a different nationality. This is a sobering thought when one reflects that there is nothing to connect Agamemnon, Achilles, Priam, and Hector with the fire-blackened layer of thirteenth-century ruins known as Troy VII A (the archaeologists’ candidate for Homer’s city) except a heroic poem which cannot have been fixed in its present form by writing until the late eighth century, at least four illiterate centuries after the destruction. No reader of the Odyssey can have failed to be amazed and puzzled by the central role gifts play in the social relationships of the characters. Telemachus at Sparta, a young provincial with very uncertain prospects visiting the splendid court of Menelaus and Helen, is offered a parting gift of horses. He declines, on the grounds that his native island is no place to graze horses, and asks for something else: “Give me something that can be stored up.” Menelaus is delighted with his frankness and gives him a bowl made of silver and gold. There are many such encounters in the Homeric poems and readers seeking some explanation of the generosity and especially of the unashamed claims made on it usually found themselves fobbed off with a discussion of Homeric hospitality and the guest-friend relationship. Finley put it firmly in a familiar anthropological context. The word “gift” is not to be misconstrued. It may be stated as a flat rule of both primitive and archaic society that no one ever gave anything, whether goods or services or honors, without proper recompense, real or wishful, immediate or years away, to himself or to his kin. The act of giving was, therefore, in an essential sense always the first half of a reciprocal action, the other half of which was a counter-gift. His persuasive analysis of the working of this form of exchange in the poems was widely accepted; those who objected that it reflected not a society but a “heroic ideal” are given short shrift in the new edition. Finley’s arguments from the system’s internal coherence and its recorded existence in real societies are compelling but a lingering doubt may remain. Speaking of the belief in the historical reality of the Trojan War and the Catalogue of Ships firmly held by some scholars who reject his sociological model he asks: “In what respect do they differ from gift-giving in their inherent credibility?” A skeptic might answer: “Not at all. Both the Trojan War and the gift-giving system may be equally unhistorical.” If the epic Muse can forget the palaces, inventories, and geography of Mycenaean Greece, remember the chariots but not how they were used, and fabricate not only a war but the names and personalities of chieftains on both sides, how can we trust her to preserve intact the memory of an intricate social system long since obsolete? Finley’s case would be stronger if the comparative method, to which he so often appeals, could produce a parallel: an oral epic poem which, celebrating heroes of a bygone age, garbles time, place, and material objects but preserves, in recognizable form, a complex system of primitive social institutions. There is one oral epic which goes far toward meeting these specifications, the Turkish Book of Dede Korkut. The full text has only recently been made available in an English version3 (which may be the reason why Finley, whose mastery of the enormous Homeric literature is demonstrated in his useful critical bibliography, does not seem to be aware of it). The text on which modern editions are based was written in the last quarter of the sixteenth century but there is in existence a summary of the poem which was written down before 1332 and the text contains numerous traces of original versions dating from the tenth century. The book recounts, in a mixture of prose and verse, the deeds of the Oghuz, a tribe which, over many centuries, migrated from lands which are now in the Kazakh, Uzbek, and Turkmen Soviet Socialist Republics to become the ancestors of the Seljuk and Ottoman Turks in western Asia Minor. In their original home their raiding expeditions were aimed at their neighbors to the north, the shamanistic Kipchaks; the Oghuz were recently converted Muslims (though sometimes pre-Islamic customs remain embedded in the narrative). But the sixteenth-century version retains only occasional reminiscences of the Kipchaks and the geography of the Samarkand area; in it the Oghuz beys now live, hunt, and plunder in western Anatolia, a thousand miles to the west; their infidel enemies “worship a god made from wood” and have churches with monks in them—one of their strongholds is Trebizond, which remained in Byzantine hands until 1461. One of the institutions of the Oghuz is a spectacular variation of the gift-giving system. Their king, Bayindir Khan, commands the allegiance of the beys, the heroes of the epic; they deliver the booty from their brigand raids to him. Periodically he invites them to sumptuous feasts, at which he “distributes the wealth of the Oghuz, usually in the form of gifts to the beys.” But occasionally the feast was a “plunder banquet.” On these occasions, at the high point of the feast, the Khan would take his wife by the hand and leave; the beys would then help themselves to any of his possessions they fancied. It was, in the story, his failure to invite the Outer Oghuz to a plunder banquet which caused a fratricidal war, the “Götterdämmerung” episode which concludes the saga. On the first point he is of course right to rule out the imaginary city of the Phaeacians and also right to deny that the presentation of “walls, docks, temples, and a marketplace” can be treated as “Homer’s recognition of the…rise of the polis.” But the equally imaginary city of Troy in the Iliad does seem to prefigure some features of later social organization—in the procession of the women to the Temple of Athena in Book VI, the debate in the assembly in Book VII, above all in Hector’s devotion to Troy and its people, his sense of his duty to the community. Hector is unique in his loyalty to a larger social unit than the oikos, that extended household which, “together with its lands and goods,” was the basic nucleus of Homeric society. As for the western wanderings, it is true that there is nothing in the poem “that resembles eighth-century Ischia or Cumae, Syracuse, Leontini or Megara Hyblaea.” There is not very much in Shakespeare’s Tempest which resembles early seventeenth-century Bermuda either, but no one can doubt that the play reflects an age of maritime exploration. The fantastic adventures of Odysseus contain several features which suggest that this part of the poem was originally the saga of a voyage to the East, the voyage of the Argonauts, in fact; why should it have been adapted for a western sea-tale except to please an audience interested, if not in the actual founding of colonies, at any rate in the voyages of exploration which must have preceded their foundation? These are minor cavils. It is an unmixed pleasure to welcome this new edition of a book which has become a classic in its field, as indispensable to the professional as it is accessible to the general reader, and to look forward to Finley’s further riposte to the criticism which his spirited additions are sure to provoke. This entry was posted in Ill Met by Moonlight and tagged Billy Moss, Ill Met by Moonlight, Major General Heinrich Kreipe, Patrick Leigh Fermor on December 28, 2017 by proverbs6to10. This entry was posted in Abducting a General, Ill Met by Moonlight and tagged Abducting a General, Billy Moss, Chris White, Crete, Greece, Ill Met by Moonlight, Major General Heinrich Kreipe, Patrick Leigh Fermor on May 14, 2016 by proverbs6to10. In September last year I reported on the new award established by Gabriella Moss in memory of her father William Stanley Moss which will be awarded annually to the best student studying Philology, History and Archaeology at the University of Crete in Rehtymnon. The inaugural winner was Evi Dimitrakaki who is the granddaughter of Alexandros Platurrahos, a partisan who was actively engaged in the fight against the German occupation of Crete. Gabriella has been kind enough to pass on the text of the emotional speech given by Evi at the award ceremony. I would like to share with you some personal thoughts and emotions, regarding the prize in honour of William Stanley Moss. Due to the nature of the prize and its relation with the Second World War and the fights of Cretan people, I considered to be almost obliged to participate as a candidate, no matter what the outcome would be. You may wonder why… As the granddaughter of one of the partisans, who fought on the Psiloritis mountain during the German Occupation, I think that I had the duty to do so! Alexandros Platurrahos coming from the village Kouroutes of Amari in Rethymnon, my grandfather, used to tell us stories related with the National Resistance period. He was narrating to us while we were sitting under the lemon tree in the yard of his house almost every summer night. You can imagine two children (me and my brother Giorgos) hanging upon his lips. And later on, imagine two teenagers listening with interest and waiting anxiously for him to finish the narrations of his adventures. In these stories of course, my grandfather was not the only one to participate. His brother, Giorgis, who was imprisoned and tortured by the Germans, and his younger brother, Haridimos, who fought although he was just sixteen years old, were also acting against the Germans. Furthermore, the women of the family, Popi and Marioleni, were providing the partisans with supplies, such as clothes and food. They were also offering shelter to other partisans at the risk of their own and the whole family’s lives. The members of my family were not the only fighters during the Occupation period. There were a lot of them all over the country! I think that it’s worthwhile to let you know of one more thing: when I was informed that I was one of the candidates selected for the prize, I felt the same emotion I was feeling when I was a kid, during my grandfather’s narrations. I was informed on the 25th of March, which is my name day, while I was visiting my grandfather’s house in Kouroutes. Was it just a coincidence? Fate? Or maybe God? Hence, you can understand the particular emotional feeling that overwhelms me just by participating in this contest. This prize is therefore dedicated to him, to his memory and his fights. It is devoted not only to the sacrifices he made, but also to those made by the rest partisans, sacrifices that were never acknowledged for most of them! For those of you that may feel touched, shed tears, or even resent by hearing these words: you know and we all know that their first and only thought was their country and they were never looking after for any kind of appreciation! They did that not because it was easy or usual. As my grandfather used to say, “Evita (that’s how he was calling me) being and acting as a partisan was very difficult. We fought for the country risking our lives”. He also used to say: “They were extremely difficult times because fear and misery were spread everywhere”. So they were risking their lives without caring to the slightest bit. Their moral honour didn’t allow them to act otherwise! We should at least acknowledge that! Having in mind as a life model my grandfather Alexandros and each one of us his own Alexandros, it is our duty to stand up and be worthy inheritors of their legacy, their morality and their virtues! Reaching the end, I would like to thank my supervisor, Associate Professor Ioanna Kappa, who has always been helpful to me during my studies. I also want to thank Professor Elena Anagnostopoulou, since the project evaluated for the prize was accomplished under her guidance during her seminar lectures. Above all, I would like to thank Mrs Gabriella Bullock who established the prize in honour of Stanley Moss. Not only because of the financial assistance (which is very important for me to carry out my studies), but mostly because in this way she recognizes the fights and sacrifices made by her father and our own people. We are grateful to you and your family, because like your father, who offered the maximum of his powers to the Cretan people without hesitating seventy-one years ago, you are honoring Crete today in your own way! Mainly though, I would like to thank you because due to the prize, you have given me the opportunity (I hope to others as well) to recall that we have the privilege to be proud children of those fighters, proud Cretan, proud Greek! The original story of the award is found here. This entry was posted in Ill Met by Moonlight and tagged Billy Moss, Cretan resistance, Crete, Gabriella Bullock, William Stanley Moss on April 14, 2016 by proverbs6to10. I have returned. Some of you may have wondered if I had disappeared in a bog on my long walk before Christmas, others perhaps that there is nothing more to add to the Paddy blog. Fortunately neither is true although the walk was massively hard. I suffered a bout of flu the week before and was quite uncertain if I would be well enough to start on time. The main symptoms did disperse, but I was very weak and probably not strong enough to tackle the hills and terrible ground conditions that we found (see this video here). It was not really until we reached drier conditions in Hampshire in the last two days that I had recovered my strength enough, but aided my by walking companion, my son, and the ever-present need to meet the target and raise money for the two chosen charities, we pressed on. We were joined by Billy Moss’ daughter Isabelle and his grand-daughter Jody Cole Jones for the last 10 km into Winchester. They wished to support the causes, and Combat Stress in particular, as they wanted to highlight their belief that Billy probably suffered from some form of post-traumatic stress which may have led to his early demise. The Just Giving page remains open for any final donations here. Since then I have been in Germany celebrating Christmas with my youngest daughter Harriet, and then preparing for a new job which I started in the New Year. So I am now ready to get back in harness and present you with some fascinating material. As ever I am grateful to those of you who have been in touch with ideas and material. I look forward to a successful 2016 for us all and send you my best wishes. This entry was posted in Uncategorized and tagged Billy Moss, combat stress, like a tramp on January 17, 2016 by proverbs6to10. In July, Gabriella Bullock, one of “Billy” Moss’ daughters, travelled to Crete with her husband Hugh to present the inaugural prize in Billy’s memory at the University of Crete in Rehtymnon. The annual William Stanley Moss award is open to graduate students of the Faculty of Philosophy studying the subjects of Philology, History and Archaeology. 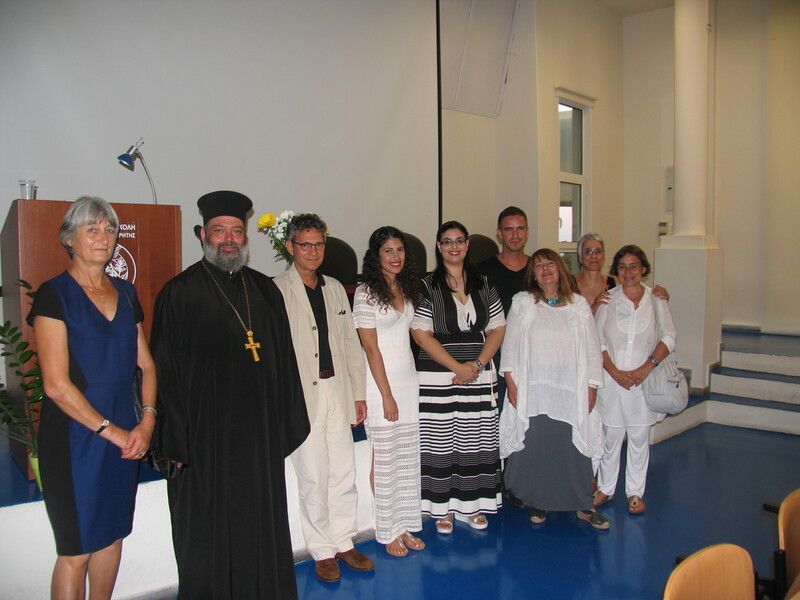 The ceremony on 21 July was attended by the Metropolitan of Rethymno and Avlopotamos the Reverend Nicholas Nikiforakis, the Rector Euripides C. Stephen, the Dean of the Faculty of Philosophy Lucia Athanassakis, the Dean of the School of Education Anthony Chourdakis, the Chairman of the Department of Literature Angela Kastrinaki the President of Department of History and Archaeology Antonia Kiousopoulou, Emeritus Professor Anastasios Nikolaidis, Professors of academic departments of the University of Crete, Foundation staff and students. Gabriella and Hugh went on to deliver talks in Anogeia and Patsos where they met many relatives of those who worked with Billy and Paddy in those desperate days of the war. This entry was posted in Abducting a General, Ill Met by Moonlight and tagged Billy Moss, Gabriella Bullock, William Stanley Moss on September 2, 2015 by proverbs6to10.